Incredible Exterior Features of the Jeep Compass | South 20 Dodge Chrysler Ltd. 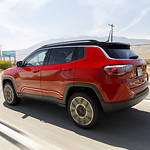 The Jeep Compass is a popular compact SUV. At South 20 Dodge Chrysler Ltd., we’re excited to show off all of the great-looking exterior features. It can ensure that you get behind the wheel of a bold choice. There’s a lot of sleek curves that offers an athletic appearance to the Jeep Compass. You can feel as confident as it looks when you drive it down the road. Powerful fenders and a sloping roofline will help to add a fierce look. Eight available wheel designs can also help you to personalize the Jeep Compass. This includes sizes that range from 17 inches to 19 inches. Lighting throughout the Jeep Compass shouldn’t be missed, either. This includes front headlamp options with daytime running lights and an available LED lighting strip. The rear lights have a signature look to them, too, complete with an LED option. The stylish accents are sure to draw attention to the front and back of the Jeep Compass.